UFO SIGHTINGS DAILY: Highly Detailed Reptilian Face Found On Mars Surface, June 2016, Video, UFO Sighting News. Highly Detailed Reptilian Face Found On Mars Surface, June 2016, Video, UFO Sighting News. This face was discovered by a new Youtuber called DailyRealDiscoveries. 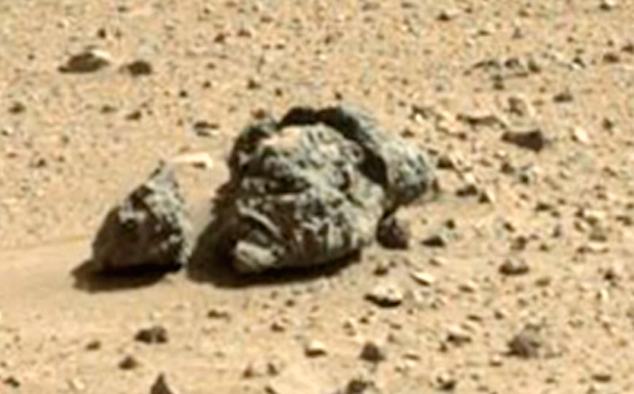 He posts a lot of interesting finds on the Martian surface and this face is highly detailed. The eye nose, lips, mouth and ear are clearly obvious with its unusually uneven skin. The alien looks reptilian, which is suppose to be an aggressive species that doesn't like humans very much. The face is at the end of the video at the 3:53 mark.